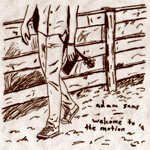 With a message of encouragement and a desire to create something more than just the same old stagnant kind of music that plagues today's music industry, Adam Sams has delivered upon us his debut EP, Welcome To The Motion. It's an EP full of love, faith, and longing, while managing to make Sams one of the better independent singer songwriters in today's market. Welcome To The Motion is mostly an acoustic bunch of songs, but it also has a fair amount of percussion, bass and harmonica, which adds a little bit of blues and southern rock to the equation. They all come together to start things off in "Nameless Race," which can easily be called an acoustic rock song. The song urges the followers of Jesus to love people regardless of where they are in life. Sams sings, "Do not hold back love from those who deserve it, when you have the opportunity to act, everyone deserves to be treated well by you, everyone deserves your love." It's not the best writing, but a good and Biblical sentiment nevertheless. "Foreign" shows a tamer side, as Sams relies on just an acoustic guitar. He's able to play a bit more intricately, which he also gets a chance to do in "Smaller." "Smaller" poses the question "Are you really entitled to anything?" and puts a huge focus on the value of humility. The title track is one of this EP's highlights. It's got a folky sound, with a lot of acoustic guitar, some light percussion and hand claps. It's a good reminder that there's a lot more to life than just existing, as Sams reminds us to keep moving so as not to waste your life away. Sams sings, "Stop just existing and start to live your life." "This Old House" is another highlight, sounding like a more Americanized, less folky Mumford & Sons. Of course the vocals are completely different; it's all in the guitar style for that comparison. I like the analogy in the song, where Sams compares himself to an old, worn down house that's in desperate need of someone to come in and do some cleaning and make some repairs. The music fits the setting very well. "My Faith is in the Grave" brings the folk sound back, returning some drums to the mix, as well as incorporating a beautifully-played banjo. The feel of this song also reminds me of something one might hear from John Mark McMillan. Welcome To The Motion ends with "Surrounded." Musically, it's a very simple song, with mostly relaxing strumming of Sams' acoustic guitar, with a few other layers to give it some depth. It's a song that seems like it could've come out of the Psalms; it's Sams giving God his trust, recognizing that man can do nothing to us as long as we trust in God. We have no reason to fear. What a beautiful thing to be reminded of. Adam Sams is a young guy with a lot of talent. He poured his heart and soul into Welcome To The Motion, and it shows in his batch of songs. He still has room for growth as an artist, but he's certainly gotten off on a good foot, and he looks to be heading in the right direction. I'd love to hear his next release. You can preview the whole EP for free at his Bandcamp store if you're interested but not quite sold yet, and then you can get a physical or digital copy while you're there for a pretty reasonable price. Jesus freak Hideout (Scott Fryberger): When did you start penning your own songs? Adam Sams: I wrote my first song when I was on a trip to Kenya back in 2007. I was 14 years old. I had a lot of good ideas for songs during and following that time, but I guess I kept all that material pretty locked away until just a couple years ago. I wanted to get to a point where I was proud of my art before I started sharing it in public. JFH (Scott): Are you responsible for all the instrumentation on Welcome To The Motion? JFH (Scott): Who are your musical influences? Adam: I grew up listening to a whole lot of Switchfoot and Relient K. Jon Foreman's writing has probably been the biggest influence on my music. Some others are Bob Dylan, Nickel Creek, Matthew Mayfield, and recently The Avett Brothers and Mumford & Sons. JFH (Scott): What's the idea behind the album title? Adam: Welcome to the Motion is about the concept of human inertia - the idea that we tend to stand still or get stuck in the same cycles again and again unless we make a conscious effort not to. The song's chorus, "Stop just existing and start to live your life," is a call to live each day as best as you can, constantly moving forward, growing, giving, and learning. I don't want my life to be stagnant; I want each day to be spent well. I feel like this theme resonates throughout the whole record. JFH (Scott): With the music industry suffering, are you still looking to sign to a record label, or are you wanting to stay independent? Adam: I'm not sure yet. I've been reading a handful of books and talking to some people who are further down the road than I am, trying to gain insight and knowledge so I'll be able to make the right decisions when they present themselves. I reckon I'll jump that fence when I get to it! JFH (Scott): If you could spend the day with one musician, who would you choose? Adam: Probably Jon Foreman... he's continually inspired me since before I was a teenager. I'd love to hear what inspires him and talk about songwriting. JFH (Scott): I noticed that your Bandcamp store has a Christmas EP available for a name-your-price deal, with the proceeds going to a charity I'm not familiar with. Care to share? Adam: Patience and humility. Those are two things I struggle with daily. As a solo artist, it's easy for me to become focused solely on myself - my musical pursuits, my paycheck, my pleasure... I'm constantly trying to become a guy who puts more of his focus on other people. I look at how Jesus related to the people he came in contact with, and try to model that with my life.